The OCS Common Operating Picture (COP) provides Commanders with improved ability to make informed decisions based on timely visibility of OCS capabilities using common, authoritative data and information. The OCS COP allows commanders to consume OCS information at the same time and in conjunction with other operations, logistics, and intelligence information, thereby enabling more effective integration of OCS into operations. The availability of authoritative data and information in this format will facilitate planning and sourcing of OCS solutions to meet operational requirements, aid in the development of theater strategies/plans and support determination of the viability and benefit of using OCS to meet operational requirements. The OCS COP is being deployed in iterative cycles of capability according to the priorities of the GCCs and is accessible on both NIPR and SIPR environments. Capability requirements and data/information sources to be integrated to the OCS COP are gathered and prioritized on behalf of the OCS community of interest by the OCS COP Advisory Board. The Advisory Board consists of representatives from each of the GCCs and relevant Combat Support Agencies and is co-Chaired by ODASD-Program Support and the Joint Staff-J4 OCS Support Division. Awarded Procurements: provides contract data from the Federal Procurement Data System – Next Generation (FPDS-NG) via the All of Government Contract Spend (AGCS). 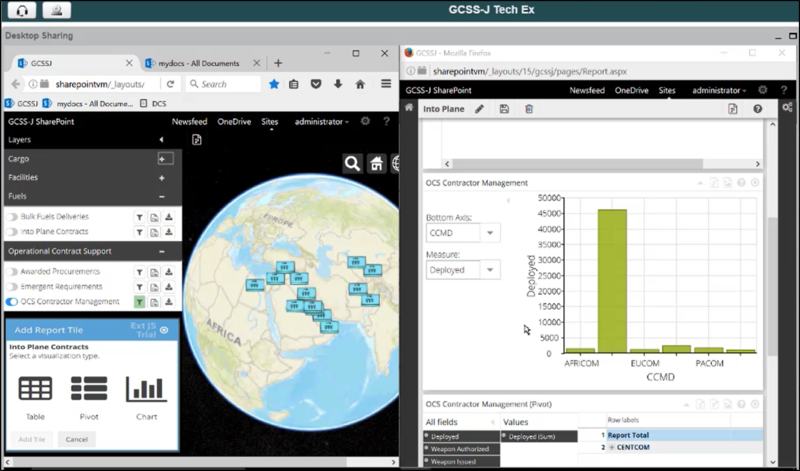 The OCS COP platform, GCSS-J, is undergoing a modernization effort to enhance its usability. The updated platform will provide users with a more intuitive interface, increased reporting, visualization, and integration capability. Sample improvements include graphical analysis capabilities, flexible report creation, export to PowerPoint, and integration with SharePoint. The initial operating capability (IOC) for the revamped GCSS-J is expected in Q2FY18. Working groups have been completed to refine the requirements of these capabilities and prioritization of the development schedule is underway. To learn more about the OCS COP development roadmap, source systems to be added in the future, and timeline, email us at osd.pentagon.ousd-atl.mbx.ocs-cop@mail.mil. To submit questions and comments regarding the OCS Common Operating Picture, email us. Advisory Board Members, access the OCS COP Sharepoint Page to view meeting calendars, agenda and other materials.